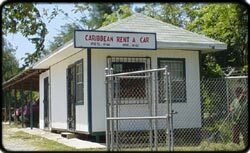 We are a small rent a car agency located on the Island of Roatan, just off the north coast of Honduras, in the Western Caribbean. Roatan is the most beautiful, largest and most developed Island for tourism in Honduras. The Island has a mountainous backbone and is totally surrounded by the coral reef, offering superb diving as well as excellent fishing. We also have some of the most beautiful white sandy beaches in the Caribbean. Roatan is a long Island, measuring almost 40 miles in length and with a total landmass of 49 square miles. Roatan is nowadays a port of entry for thousands of tourist coming from all around the world, where they will visit different destinations, and experience the natural beauty of our Island. The craft shops, the scenic beauty and diversity of activities and services welcome these visitors, who in their travels are looking for a little fun, relaxation and a closer contact with nature. Perhaps nothing defines the Caribbean as much as its beaches, those sumptuous strands of powdery sand that dramatically embroider the Island's coastline. Bathing beauties pull us to the islands like waves to shore. Once we are there, they captivate us with sensory overload: warming sun, fragrant sea air, crystal clear water, the worlds second largest barrier reef in the world and the purest of palettes-luminous aquas and brilliant turquoises, incandescent blues and whites that blind. There are enough beaches on Roatan for a lifetime of visits, each with its own personality and appeal. Some are formed with crushed corals and mollusk shells, others from pulverized volcanic rock. The beaches here in the bay Island of Honduras will linger in your memory long after after the tan has faded. So when you are planning for your next vacation, just think about white sandy beaches, crystal clear water, superb diving or excellent fishing, because Roatan has it all. Let us be your rental car agency for your next island vacation. We have a convenient pick up location at the International Airport of Roatan or free delivery and pickup service to your hotel. Also, receive a free Membership Card with a 10% discount on your next visit.